We’ve had a somewhat dreary January. I think I can sum most of the month up by saying its been very windy and very snowy. I have been sporting the look of Cousin IT from the Addams family for most of it and trying unsuccessfully not to lose my gloves. I keep hoping for a tonne of snow at the weekend but it seems to prefer just the week days this year, which is obviously very joyful when we have to all bundle into the car very early to drive to work. In the dark! BUT we did achieve some positive non dreary things this month. We now have lots of space to, no doubt, clutter up again with lots of new pretty things. We booked a holiday to a nice sunny beach and I got my new car. The last one caused a bit of a stand off and “discussion” about who would drive the car first. After much negotiating, attempts at massive bribery and promises of doing various chores around the house I still didn’t relent and had a bit of a sulky passenger in the seat next to me. He soon cheered up after I got bored within about 5 minutes. Whilst we argue about critically important stuff, Little Z has been pondering the concept of time. What is time? Why is time? Where does it go? Why does it go? It’s all very philosophical in our house right now, but as if the energiser bunny is our philosopher, asking the same loop of questions a million times a day. I’m not too sure why I opened this particular car of worms just now. It seemed like a good idea at the time! It’s my turn this week to host Loud n Proud. 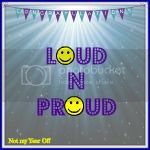 You can grab the badge for your post and link up all your big and little proud moments below. Old and new both welcome! Then pop over to Suzanne’s blog 3 Children and It next week where she will be your friendly host. This entry was posted in Toddler and tagged beatig january, holidays, how to tell time, january blues, new car, teaching how to tell time. Bookmark the permalink. It must be great to have your new score – and to have that holiday to look forward to! The end of January is in sigh and I can’t wait! A new car and a holiday sounds like bliss. It makes a real difference having something nice to look forward to doesn’t it?